What constitutes the bottlenecks for big data processing frameworks? If CPU is a bottleneck, it is easy to fix: add more machines to the computation. Of course for any analytics job, there is some amount of coordination needed across machines. Otherwise, you are just mapping and transforming, but not reducing and aggregating information. And this is where the network and the disk as bottleneck comes into play. The reason you don't get linear speedup by adding more machines to an analytics job is the network and disk bottlenecks. And a lot of research and effort is focused on trying to optimize and alleviate the network and disk bottlenecks. OK this sounds easy, and it looks like we understand the bottlenecks in big data analytics. But this paper argues that there is a need to put more work into understanding the performance of big data analytics framework, and shows that at least for Spark on the benchmarks and workloads they tried (see Table 1), there are some counter intuitive results. For Spark, the network is not much of a bottleneck: Network optimizations can only reduce job completion time by a median of at most 2%. The disk is more of a bottleneck than the network: Optimizing/eliminating disk accesses can reduce job completion time by a median of at most 19%. But most interestingly, the paper shows that CPU is often the bottleneck for Spark, so engineers should be careful about trading off I/O time for CPU time using more sophisticated serialization and compression techniques. OK, now for the CPU being the bottleneck, isn't that what we want? If the CPU becomes the bottleneck (and not the network and the disk), we can add more machines to it to improve processing time. (Of course there is a side effect that this will in turn create more need for network and disk usage to consolidate the extra machines. But adding more machines is still an easy route to take until adding machines start to harm.) But I guess there is good CPU utilization, and not-so-good CPU utilization, and the paper takes issue with the latter. If you have already a lot overhead/waste associated with your CPU processing, it will be easier to speed up your framework by adding more machines, but that doesn't necessarily make your framework an efficient framework as it is argued in "Scalability, but at what COST?". So I guess, the main criticisms in this paper for Spark is that Spark is not utilizing the CPU efficiently and leaves a lot of performance on the table. 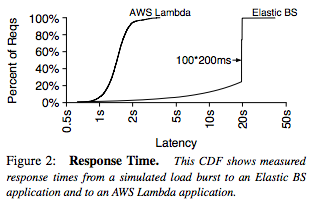 Given the simplicity of the computation in some workloads, the authors were surprised to find the computation to be CPU bound. 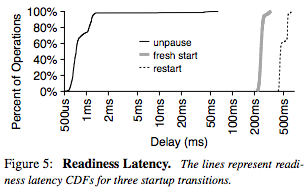 The paper blames this CPU over-utilization on the following factors. One reason is that Spark frameworks often store compressed data (in increasingly sophisticated formats, e.g. Parquet), trading CPU time for I/O time. They found that if they instead ran queries on uncompressed data, most queries became I/O bound. A second reason that CPU time is large is an artifact of the decision to write Spark in Scala, which is based on Java: "after being read from disk, data must be deserialized from a byte buffer to a Java object". They find that for some queries considered, as much as half of the CPU time is spent deserializing and decompressing data. Scala is high-level language and has overheads; for one query that they re-wrote in C++ instead of Scala, they found that the CPU time reduced by a factor of more than 2x. It seems like Spark is paying a lot of performance penalty for their selection of Scala as the programming language. It turns out the programming language selection was also a factor behind the stragglers: Using their blocked time analysis technique, the authors identify the two leading causes of Spark stragglers as Java's garbage collection and time to transfer data to and from disk. The paper also mentions that optimizing stragglers can only reduce job completion time by a median of at most 10%, and in 75% of queries, they can identify the cause of more than 60% of stragglers. 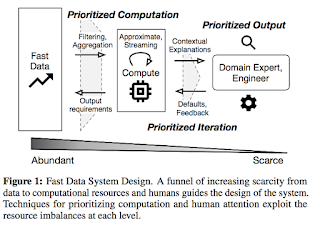 A major contribution of the paper is to introduce "blocked time analysis" methodology to enable deeper analysis of end-to-end performance in data analytics frameworks. It is too complicated to infer job bottlenecks by just looking at log of parallel tasks. 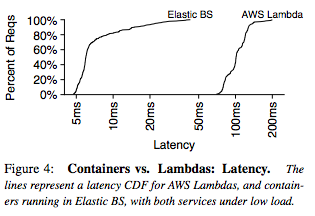 Instead the paper argues, we should go with the resources perspective, and try to infer how much faster would the job complete if tasks were never blocked on the network. The blocked time analysis method instruments the application to measure performance, uses simulations to find improved completion time while taking new scheduling opportunities into account. This analysis was done for Spark. The paper makes the analysis tools and traces available online so that others can replicate the results. The paper does not claim that these results are broadly representative and apply to other big data analytics frameworks. Frank McSherry and University of Cambridge Computing Lab take issue with generalizability of the results, and run some experiments on the timely dataflow framework. Here are their post1 and post2 on that. The results do not generalize for machine learning frameworks, where network is still the significant bottleneck, and optimizing the network can give up to 75% gains in performance. This paper appeared in CIDR17 and is authored by Peter Bailis, Edward Gan, Kexin Rong, and Sahaana Suri at Stanford InfoLab. The slogan for the system is: MacroBase is a search engine for fast data. 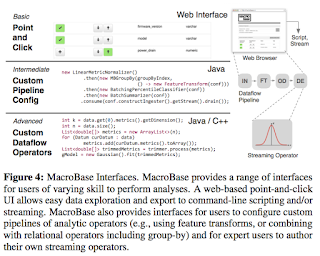 MacroBase employs a customizable combination of high-performance streaming analytics operators for feature extraction, classification, and explanation. 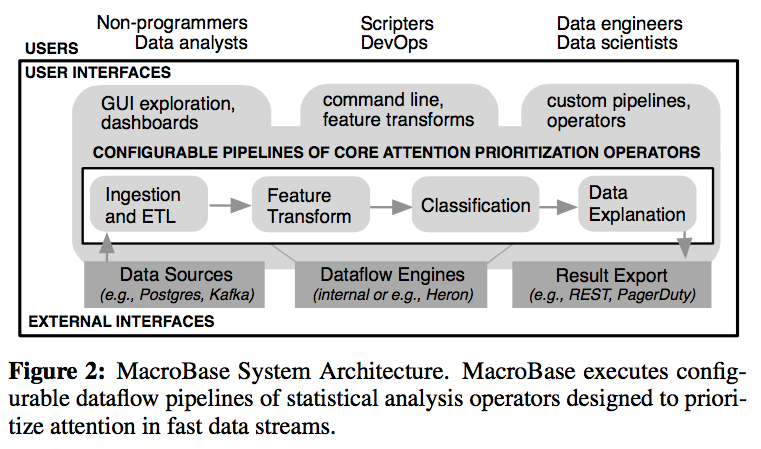 MacroBase has a dataflow architecture (Storm, Spark Streaming, Heron). 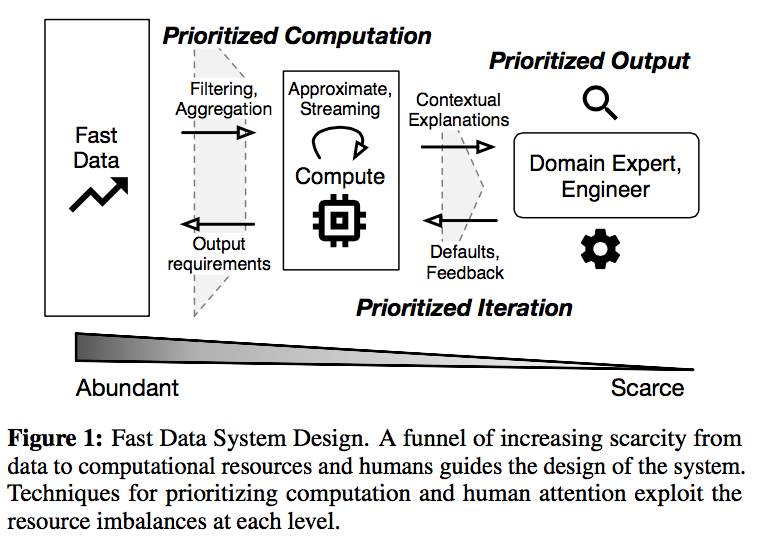 The paper argues it is better to focus on what dataflow operators to provide than to try to design from-scratch a new system (which won't be much faster/efficient than existing dataflow systems anyhow). 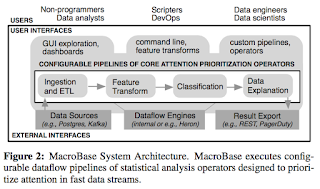 MacroBase focuses attention on dataflow operators to prioritize computation. This is done by applying classic systems techniques: predicate pushdown, incremental memorization, partial materialization, cardinality estimation, approximate query processing (top K sketch). Users are engaged at three different interface levels with MacroBase. Users highlight key performance metrics (e.g., power drain, latency) and metadata attributes (e.g., hostname, device ID), and MacroBase reports explanations of abnormal behavior. For example, MacroBase may report that queries running on host 5 are 10 times more likely to experience high latency than the rest of the cluster. As a broader theme, the paper argues there is opportunity in marrying systems-oriented performance optimization and the machine learning literature. Another big message from the paper is the importance of building combined and optimized end-to-end systems. MacroBase is currently doing mostly anomaly/outlier detection, and it is not doing any deeper machine learning training. There are plans to make the system distributed. 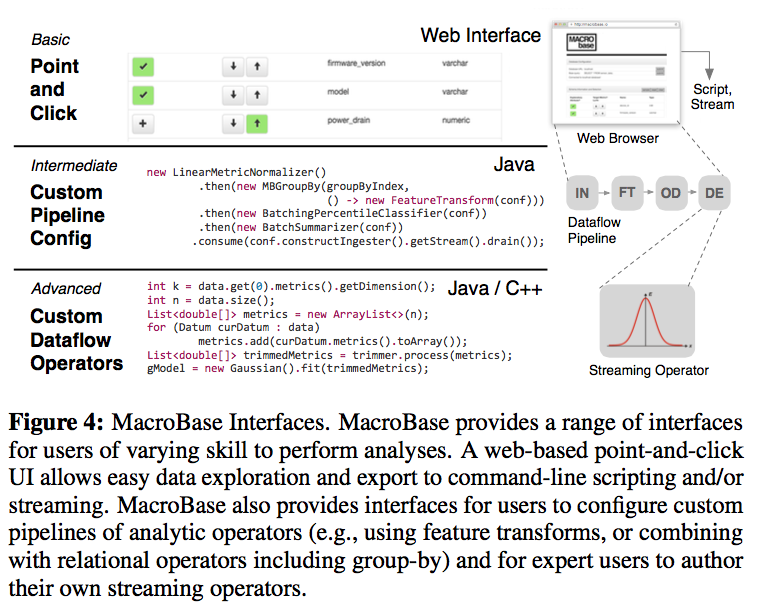 Given that it is based on a dataflow system, there are many plausible ways to achieve distribution of MacroBase.